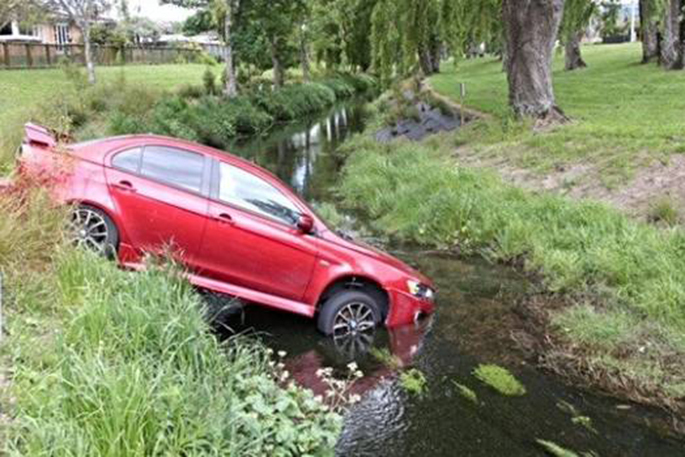 A red Mitsubishi Lancer was discovered in Waiwhetu Stream, Lower Hutt, on the morning of October 21. Image: Kevin Stent/Stuff. Spring ducklings, swans and a shiny red Mitsubishi Lancer are under the willow trees in a Lower Hutt stream. Police are seeking the registered owner of the car, which was discovered by nearby residents to be partly submerged in the Waiwhetu Stream early on Sunday morning. A police spokeswoman said staff were looking for the registered owner after being made aware of the incident at about 7.30am.